A 400 kilogram pumpkin met me the other day as I entered the grocery store. Perched several feet off the floor on a pile of wooden pallets, the pumpkin loomed large over an orange sea of smaller cousins. “I want this one,” I told my wife. I imagined the envy of our neighbours on Halloween night as I lit the intricately carved gargantuan to beckon the costumed children. My reverie was shattered by my wife’s “come on, we don’t need it.” “It will never fit into the Corolla, she said without even looking back.” “We don’t need it,” I wondered? Since when did that ever stop us from buying something, I was tempted to say aloud. “Spend now – save later” is usually with money we don’t have. We use credit to make those purchases. Later on, you may end up needing professional credit counselling. By spending now to save later you lock in your costs with no guarantee of saving down the road. Purchases of bulk items such as baking ingredients can lead to waste when you discard excess items later. Purchases of perishable goods in bulk can lead to spoiling. Spending on food items in ‘family size’ portion or items in extra large containers can lead to excess consumption and health problems. 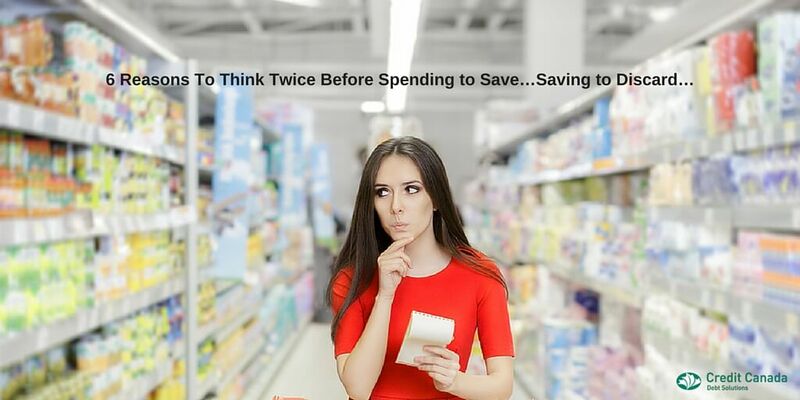 “Spend now – save later” sometimes results in purchases that you don’t really want or need. I remember several years ago, we were thrilled to purchase memberships at an exclusive “club” style factory store. Non members were not even allowed into the building. We felt special, like a privileged class. We had arrived at the highest level of the shopping elite. When we entered the store, I flashed my membership card with the pride and satisfaction of an off duty police officer being stopped for speeding. We have arrived and we belong! During that trip, we bought two litres of lemon juice (don’t ask me why). I remember my consternation a year and a half later when holding the bottle up to the light I could see clumps of mould suspended in a dark liquid. I promptly dumped the untouched bottle in the recycle bin. It seemed like a good deal at the time, I thought. It was a clear case of spending to save…saving to discard.